We just announced that we are partnering with Operation Gratitude to promote dental hygiene in kids while supporting US troops during the Halloween season. The “Halloween Candy Buy Back” event offers children the opportunity to sell their excess Halloween candy for $1 per pound at any of the three Hibiscus Dental Offices. The candy will be sent in care packages to U.S. troops serving overseas via its partner, Operation Gratitude. Hibiscus Dental wants to make proper dental care a part of every family’s Halloween. Global sugar consumption for kids increases by about 2% annually and currently sits at 50 million tons per year, which means parents need to be sure their kids teeth are being cared for more than ever. Candy, as well as hurting children’s teeth, can lead to hyperactivity and weight gain. In some cases, the wrong types of candy can also lead to broken and damaged braces. Hibiscus Dentall will be shipping candy via Operation Gratitude, a 501(c)(3), volunteer-based organization that annually produces over 100,000 care packages for U.S. Service Members deployed in harm’s way. For the past five years, Operation Gratitude, through the Halloween Candy Buy Back initiative, has encouraged dentists to collect Halloween candy from their patients for donation to the troops. Candy can be dropped off at any of the three Hibiscus Dental offices (Satellite Beach, Merritt Island, and Suntree/Viera) from Tuesday, November 1st through Friday, November 4th during regular office hours. The program is open to all children, regardless of whether they are currently a Hibiscus Dental patient. All candy must be sealed or wrapped in original packaging. 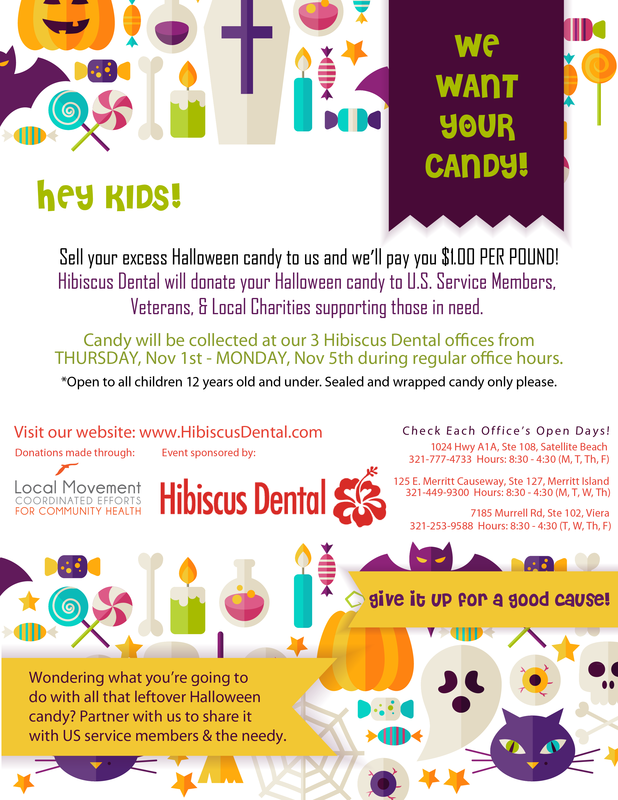 For more information about Hibiscus Dental and the Halloween Candy Buy Back Program, visit www.hibiscusdental.com or call us at 321-777-4733. Operation Gratitude is a 501(c)(3) nonprofit, volunteer-based organization that sends care packages and letters of support to individual Soldiers, Sailors, Airmen & Marines deployed in harm’s way, to their children left behind, and to First Responders, Veterans, New Recruits, Military Families, Wounded Heroes and their caregivers. The organization’s mission is to lift morale, bring a smile to a service member’s face and express to our Military and their families the appreciation and support of the American people. Operation Gratitude annually sends 100,000+ care packages filled with snacks, entertainment items and personal letters of appreciation addressed to individually named U.S. Service Members.